Posted on 07/13/2017 at 12:13 pm. Quote “Back in 2005, an unknown heavy rock trio from Fargo, North Dakota, released a self-titled demo on a CD-R, and it turned out to be a record that just wouldn’t go away. Egypt’s “Egypt” smoldered for the next several years on the basis of underground word-of-mouth, to the point that Lyderhorn Records put it out on vinyl in 2007 and cult stoner imprint MeteorCity picked it up for a CD release in 2009. By then, it had outlasted the band – bassist/vocalist Aaron Esterby, guitarist Ryan Grahn and drummer Chad Heille – who called it quits in 2006. They reunited for a one-off hometown gig in May 2010, and it wasn’t long after that rumors started circulating of new material in the works. Grahn would leave the band before “Become the Sun” was finished and be replaced by Neal Stein, who also recorded the album. When they were done, ten years and one breakup later, they finally had a proper full-length debut, selling out initial pressings of both formats, CD and vinyl. Later 2013 brought the “Cyclopean Riffs” single, and in 2014, Doomentia repressed “Become the Sun” on vinyl. The “Self-Titled” also got yet another reissue, this time on vinyl and in time for Egypt to embark on a Midwest tour with a slot at Wisconsin’s ‘Days of the Doomed’ fest at its center. More than a decade after starting out, Egypt were more active and more widely known than they’d ever been. There’s nothing happenstance about it, in an age where word can travel faster than it ever has, Egypt have slow-burned their way to the fore of the American stoner rock… for a band who regrouped by popular demand, and have only gathered momentum since, Egypt are just beginning to shape their empire.” enquote. 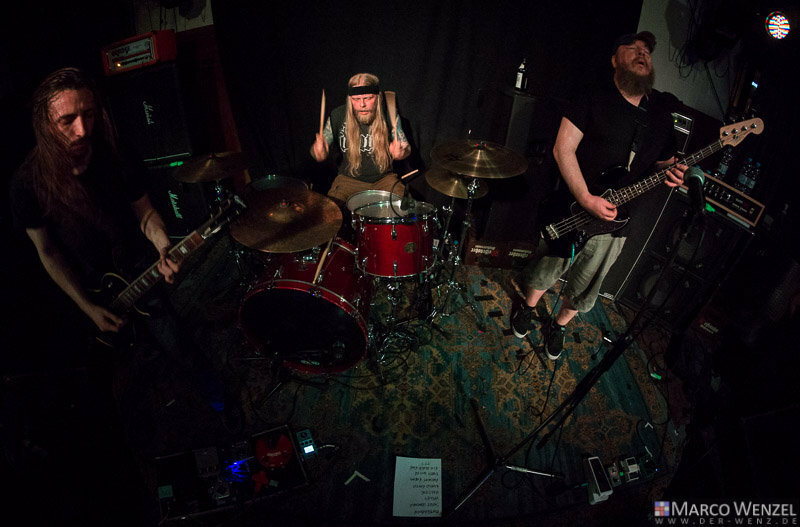 With this latest Album, “Cracks and Lines,” there is no question that this power trio is ready to take their place in the hierarchy of doom/stoner metal elite and have delivered the heaviest, most cohesive record to date. Five tracks and 39+ minutes of sonic bass lines supported by a drumline that could blow your speakers with the brutality of attack and a guitar line that is slathered on with abandon covered with vocals that is the quintessential ‘gravy on the potatoes’ for this masterpiece. An absolute MUST-HAVE, go get it RIGHT NOW if you haven’t already, make SURE to see them in a live-setting if given the chance and share it with anyone and everyone as music of this caliber DESERVES the be heard, and as always, keep it LOUD! !